When we arrived in Montreal a few weeks ago it was cold and rainy. Suddenly a few days ago the weather changed. It was sunny and bright over the Mother’s Day weekend and yesterday the temperatures were around 18°C. Ice cream places were busy and hot tea and coffee was replaced by cold coffee, iced tea, fresh juices etc. A few weeks ago, leaves and buds on trees and plants still appeared tightly folded and suddenly a spurt of sunshine and they are unfolding into beauties. Ferns, pansies, daffodils appear bright as the sunshine. However, today the weather has changed back to a dull grey but plants are dancing in the slight breeze. Mother’s Day and sunshine called for some dessert and I decided to use Neel’s ice cream maker. I get so excited and amazed at the same time as to how quickly I can make home made ice cream or frozen yogurt within 30 minutes all without artificial flavours, colours and other ingredients. During my last visit, I had made blueberry ice cream and apple cinnamon ice cream which I have not blogged as yet. Both turned out delicious and I promise to share the recipes as soon as I get back home, which is by this weekend. 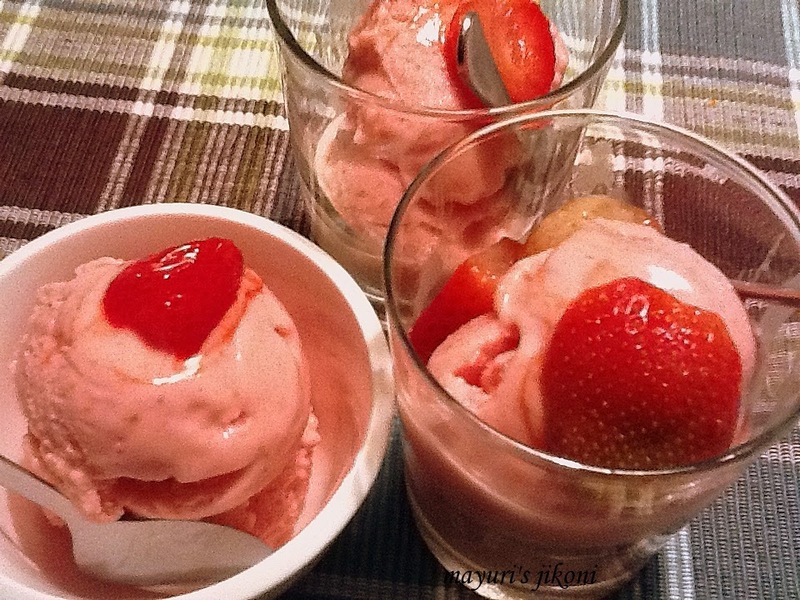 In the meantime hope you like my strawberry frozen yogurt. We finished half a litre in 2 days…. yes we love our frozen treats. Add strawberries, sugar and yogurt into a blender. Blend the mixture till the strawberries are crushed. Take out the ice cream maker bowl from the freezer and set it up. Pour the strawberry mixture into the bowl. Cover the bowl and start the machine. Within 20 minutes, the mixture will freeze. Remove the frozen mixture into a container. At this stage, the frozen yogurt is soft. Serve if you like really soft serve or place a lid on the container and put it in the freezer. After half an hour, the frozen yogurt will have set. Scoop it out into serving bowls and serve on its own or with your favourite topping or some chopped fresh strawberries. If you don’t have frozen strawberries, use fresh ones. Place strawberries and sugar in a bowl. Mix and leave for 30 minutes. Add yogurt and blend. Put the blended mixture in the fridge to chill completely. This takes about 30 minutes. After it is chilled add it to the ice cream maker. To freeze strawberries, wash and hull them. Place them on a tray in a single layer and freeze. Once frozen you can store them in a bag or container in the freezer. Use 1 cup sugar if the yogurt is a bit sour. If you do not get greek yogurt where you live then just put normal yogurt into a muslin cloth over a strainer. Let the excess water drain out. I usually place a thick layer of newspaper under the strainer and put some heavy weight on top (like a stone, brick, mortar) to quicken the process. Now you have thick yogurt to use for a frozen dessert. Follow instructions as given for your ice cream maker. Just love creamy dream strawberry yogurt. Home made is always the best.Such a lovely colour. Thank you so much Preethi. I too love it.